Almost naturally, Parc Sun-Yat-Sen, also called Zhongshan Park by some, was the location of Montreal’s presumably only public commemoration of 6/4, known as the Tiananmen Square events in the West. The park is in fact more of a square in the middle of Chinatown and is often partly occupied by Falun Gong practitionners, alongside tourists and senior citizens living in the area. Today was a special anniversary of 6/4, as it marked the 20th year after the sad events. When I visited Parc Sun-Yat-Sen this afternoon, two distinct groups were present, namely Amnesty International and the Falun Gong (FLG). Although they didn’t brand themselves as FLG, upon reading some of the posters, bearing slogans that cursed the Chinese Communist Party’s, one immediately recognizes the FLG’s particular style (which the Amnesty group confirmed). 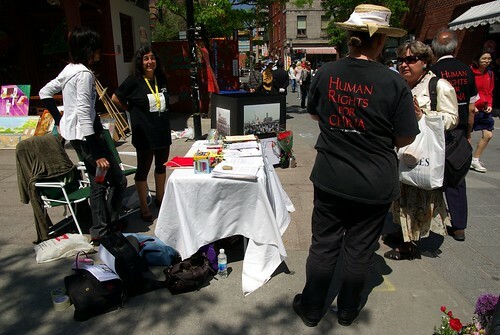 On the other side of the park, the representative from Amnesty told me that their group has had a presence in Montreal’s Chinatown every June 4th since 1989, except on one occasion. 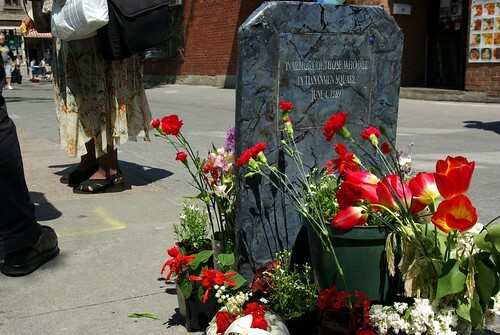 They created a space with an improvised tombstone where passersby could mourn the victims of 6/4. 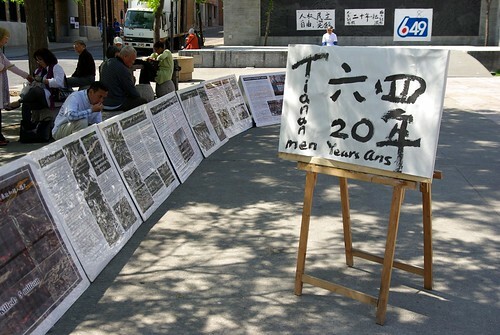 The man from Amnesty said that Tiananmen Mothers, a group led by Ding Zilin, whose own son died in Tiananmen Square during the protests, were forbidden to mourn on Beijing’s most famous public space and this was a way to pay them tribute. 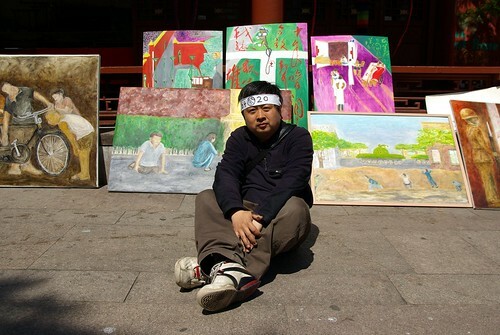 Standing out was a visual artist name Liu Yi (Louie) WANG, who told me that he was present in Beijing, in Tiananmen Square, when the tanks rolled in. The diminutive man brought with him to Parc Sun-Yat-Sen various paintings that he made of scenes that he witnessed on that fateful June 4th, like one of people surrounding a bicycle that had gotten rifles shots earlier on. Next Next post: How about a bowl of Lanzhou noodles?